Capt. 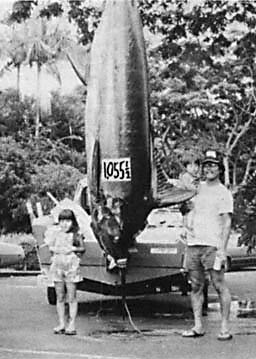 Ted Toriano and Lloyd Toriano were fishing in the Kona Mauka Trollers Tournament when they hooked and struggled with this huge blue for three hours. It was the second grander caught in the history of the tournament and was brought in on the Torianos 19-foot boat, the SHAR LYNN II.